The list of most interesting people in the world might have a multitude of names on it, and yet Peter Freuchen’s could be at the top. His life seems like a few different biographies merged into one unique story. Freuchen was a student of medicine in Copenhagen, became an Arctic explorer, a journalist, a writer of several books, scriptwriter for the movie industry specializing in Arctic-related scripts, an anthropologist who studied the Inuits on Greenland, an anti-Nazi who escaped being killed by the Third Reich, and that’s not all, folks. The young Freuchen was the son of a Danish businessman and was expected to become a doctor. He was bright and intelligent, and enrolled at the University of Copenhagen, where he studied medicine. And then suddenly, in 1906, when he was only 20 years old, he embraced his adventurous spirit and sailed north. And by north, he meant as far as possible. When he couldn’t sail any farther, he traveled 7,000 miles by dogsled. Freuchen found his soulmate in polar explorations in Knud Rasmussen, a Danish-Inuit anthropologist and Arctic explorer, often called “the father of Eskimology.” Rasmussen was just as “wild” as his friend and is the first known European to have crossed the Northwest Passage with a dog sled. Together, the two friends went on many expeditions across Greenland. In 1910, they established a trading base at Cape York (Uummannaq), Greenland, the Thule Trading Station. The name means “Ultima Thule,” the northern-most station in the world. One of Freuchen’s most significant expeditions was the Thule Expedition in 1912, when he dismissed Robert Peary’s claim that Peary Land and Greenland were divided by a channel. To test Peary’s claim, Freuchen traveled 620 miles by dogsled on the inland ice. Later, in his autobiography, Vagrant Viking, he described more details of the expedition. Apparently, his crew got caught in a blizzard, and the Dane took shelter under a dogsled. However, he soon got buried in snow that turned into ice. Lacking any spears or daggers, he created a dagger out of his frozen feces and broke the ice with it and his bare hands. In the meantime, the Danish explorer discovered the Inuit culture, which suited him just fine. After all, he was a 6 six foot 7 inches in stature, so the Pole was the real challenge for him. He had killed a polar bear and made himself a coat of it. Freuchen remained to live, travel, and hunt with the Inuits on Greenland for many years. In 1911, he married Navarana Mequpaluk, an Inuit woman with whom he had two kids, a boy, Mequsaq Avataq Igimaqssusuktoranguapaluk, and a girl named Pipaluk Jette Tukuminguaq Kasaluk Palika Hager. Frauchen visited home from time to time. In 1921, his wife died during the Spanish Flu epidemic, and the local Christian church refused to bury her, so Freuchen did it himself. After a few years, he left Greenland as a new political movement sparked his interest. Back in Denmark, he became a member of the Social Democrats and regularly wrote for the political newspaper, Politiken. In 1924, married Magdalene Vang Lauridsen, a multi-millionaire heiress whose family fell under the charms of Freuchen. Her father, Johannes Peter Lauridsen, was the director of Danmarks National Bank at the time. He liked his son-in-law so much that, in order to assist his journalism career, the man established the magazine Ude of Hjemme in 1925 and made Frauchen its editor-in-chief. The magazine circulates to this day, and it’s the longest-running Danish magazine. He also was regularly engaged by the movie industry as a consultant and even a scriptwriter on scripts related to the Arctic. He was featured as the Ship Captain in Eskimo/Mala The Magnificent, which won an Oscar in 1933. It all sounds like an Odysseus-worthy epic voyage through life, but it is indeed Freuchen’s biography, and it doesn’t end yet. He was still making trips to the north, and during one trip he lost his toes. In 1926, when he returned to base camp after an expedition, Freuchen found out that gangrene got his toes because of frostbite and before it got worse, the man amputated his own toes without anesthesia and replaced his leg with a peg. He remained married to Vang Lauridsen for 20 years before they split in 1944. 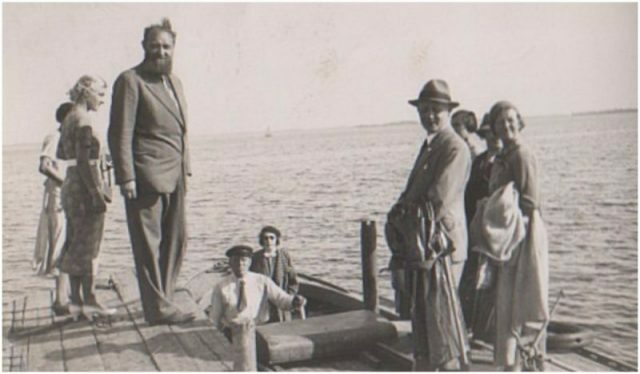 During WWII, Freuchen, a Jew himself, volunteered in the Danish Resistance when his country was occupied by Nazi Germany. According to some records, he feared neither a Nazi nor their weapons. Instead, he would straighten up to his full height above anyone who spread Nazi propaganda and say, “I’m a Jew.” He was also actively spreading anti-Nazi propaganda. He was so effective in it that there was a direct order from the Third Reich for him to be eliminated. Freuchen was captured and sentenced but managed to escape in Sweden in 1945. 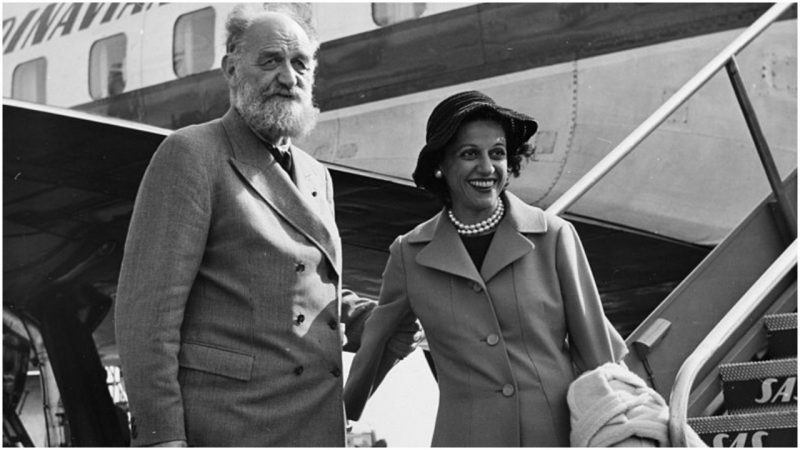 A year after his divorce, Freuchen married the Danish fashion illustrator Dagmar Cohn, who was 20 years his junior. After he escaped to Sweden, the explorer said farewell to his adventures and moved to the United States with Cohn, where she started working for Vogue. Freuchen joined the New York Explorers Club and gained a lot of popularity with his books about his explorations. In 1956, when he was 70 years old, the Danish legend was invited on the popular quiz show The $64,000 Question and became the fifth person to win the jackpot on the game, walking away with $64,000. Freuchen died of a heart attack in 1957, at the age of 71, only three days after he completed his final book, Book of the Seven Seas. He was cremated, and his ashes were scattered on Mount Dundas outside of Thule.